When the Common Core hit the public school system in 2009, education shifted from a whole-child approach to a more narrow focus centered around passing standardized tests. The goal, in part, was to maintain a certain standing with the Department of Education. As many schools opted to increase instruction time during the academic day, or extend the school day altogether, a common casualty quickly became recess. Today, recess time is limited across the country, if present at all, and the impact has been widely debated. In response to the reduction of recess across the country, the American Association of Pediatrics authored a policy statement in 2013, which recognizes the important role that recess plays in a student’s academic day. It affirms the need to provide each child with an opportunity to engage in “unstructured physical activity.” Regular breaks from the academic day enable children to practice and develop social skills, use their imaginations, and engage in physical activity, all of which enhance cognitive performance in the classroom. 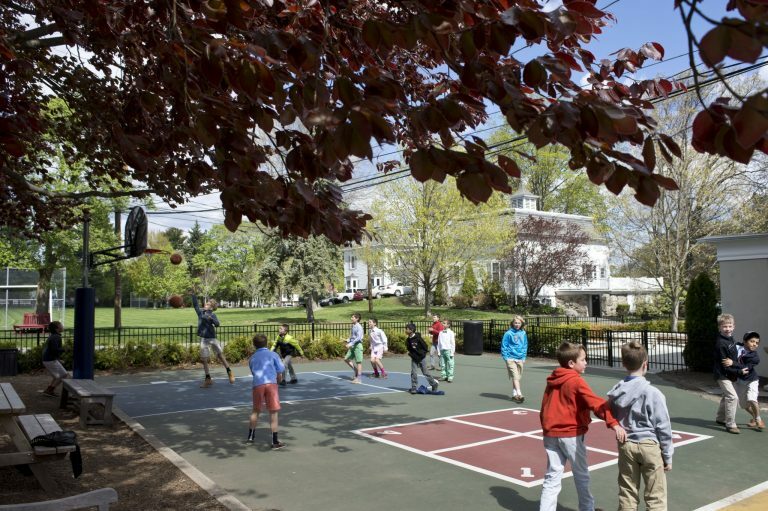 At Fessenden, we recognize that recess is an important, beneficial, and necessary component of a middle schooler’s academic day. We infuse multiple opportunities for children to capitalize on the benefits of recess into strategic times of the day. For example, every day during our PLR, or Pre-Lunch Recess, we ensure that all of our students have a chance to experience social, physical, and mental breaks. The benefits of holding recess just prior to lunch were highlighted in a 2014 study by Joseph Price and David R. Just, titled, “Lunch, recess and nutrition: Responding to time incentives in the cafeteria.” In their research they found that student consumption of fruits and vegetable rose by 54% when lunch followed a recess period. The social benefits Pellegrini speaks of are multi-faceted. To begin with, recess offers middle school students an opportunity to interact with large and diverse peer groups. While the unstructured nature of recess may lead to social conflict, it also provides students with the earliest opportunities to practice their conflict resolution skills. The ability to sort through conflict with a peer is a skill that many remember first approaching while on the playground. Middle school attempts at conflict resolution can be “messy,” but it is the messiness that is important because it most accurately reflects real-life situations children will face later in their lives. Of course, the watchful eye of the teacher is essential in modeling and aiding the students during these formative situations. What does recess look like at your child’s school? Do you see the benefits? Tell us in the comments section below. Is a Quality Pre-K Program Essential to Your Child’s Future?